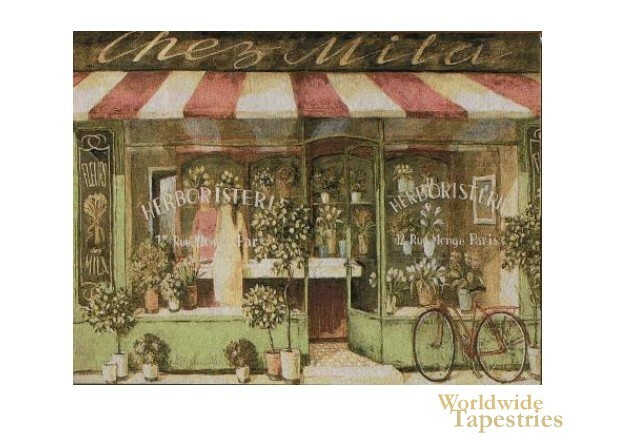 In Mila's Herbalist Shop tapestry we see the work of artist Fabrice de Villeneuve. Here we see a herbal florist shop with quaint topiaries, potted color and bicycle outside the shop where ladies are conversing inside. A Herboristerie is a shop which prepares medicinal plants and flowers. It is a Parisian scene where the romance and character of Paris comes through in the works of de Villeneuve which portrays these themes so beautifully. This Mila's Herbalist Shop tapestry is backed with a lining and a tunnel for easy hanging. Note: tapestry rods and tassels, where pictured, are not included in the price. Dimensions: W 50" x H 35"